Yachts at the Monaco Grand Prix are blessed with a trackside view as the race snakes along Monaco's waterfront and harbour. 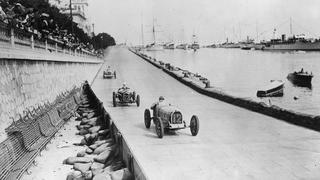 Since the Monaco Grand Prix began in 1929, the race has grown and changed with the times. So too have the yachts at the Monaco Grand Prix. What is now the biggest and most glamorous automobile race came from humble beginnings – the first Monaco Grand Prix saw 16 participants vying for a prize of 100,000 francs. The photo above shot in 1934 shows Pierre Veyron driving a Type 51 Bugatti ahead of Carlo Felice Trossi in a Scuderia Ferrari P3 Type B Alfa Romeo. What makes this photo stand out – besides the now-historic F1 cars – is the yachts in the background, what we would certainly now consider “classics”. This doesn’t mean these were small vessels by any means. Some of the top classic yachts in the world were delivered in the early 1900s, such as the 60.96 metre Madiz, built in 1902, and the 83.21 metre Dannenborg, built in 1931, which bears a striking resemblance to the yacht to the far right. Yachts at the Monaco Grand Prix are blessed with a trackside view as the race snakes along Monaco's waterfront and harbour. Since the Monaco Grand Prix began in 1929, the race has grown and changed with the times. 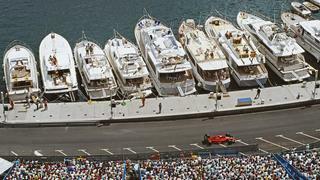 So too have the yachts at the Monaco Grand Prix. What is now the biggest and most glamorous automobile race came from humble beginnings – the first Monaco Grand Prix saw 16 participants vying for a prize of 100,000 francs. The photo above shot in 1934 shows Pierre Veyron driving a Type 51 Bugatti ahead of Carlo Felice Trossi in a Scuderia Ferrari P3 Type B Alfa Romeo. What makes this photo stand out – besides the now-historic F1 cars – is the yachts in the background, what we would certainly now consider “classics”. This doesn’t mean these were small vessels by any means. Some of the top classic yachts in the world were delivered in the early 1900s, such as the 60.96 metre Madiz, built in 1902, and the 83.21 metre Dannenborg, built in 1931, which bears a striking resemblance to the yacht to the far right. 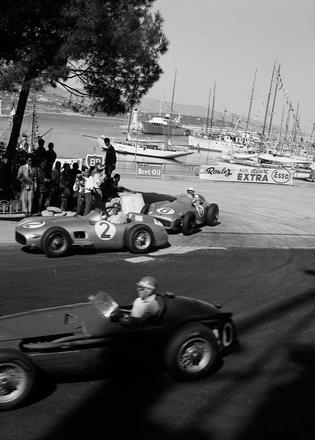 In this photo from 1955, we see Cesare Perdisa driving a Maserati 250F, moving over to allow Juan Manuel Fangio in the Mercedes-Benz W196 and his teammate Stirling Moss in the Mercedes-Benz W196 pass by. But the scene stealers are the graceful sailing yachts in the background. The prevalence of sailing yachts in attendance at the Monaco Grand Prix – many more than motor yachts this particular year – is notable. Quite a difference from today where it’s predominantly large motor yachts crowding the harbour. In this photo from 1955, we see Cesare Perdisa driving a Maserati 250F, moving over to allow Juan Manuel Fangio in the Mercedes-Benz W196 and his teammate Stirling Moss in the Mercedes-Benz W196 pass by. But the scene stealers are the graceful sailing yachts in the background. The prevalence of sailing yachts in attendance at the Monaco Grand Prix – many more than motor yachts this particular year – is notable. Quite a difference from today where it’s predominantly large motor yachts crowding the harbour. 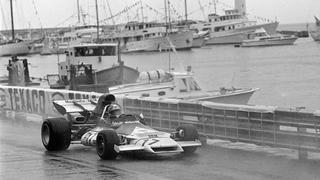 In 1972, the F1 race cars are starting to look more modern than the yachts that line the harbour. But don’t let this fool you, yachts are keeping apace. Only a year later, for instance, the Jon Bannenberg design The One, launched as Carinthia VI, debuts – which is still regarded as one of the most beautiful yachts in the world and has gone on to inspire modern builds like Lürssen’s Limitless. In the photo above, French driver Jean-Pierre Beltoise drives his BRM to victory, winning the 1972 Monaco Grand Prix. The yachts in background watching the race all fly the classic pennant flags and look very stately indeed. In 1972, the F1 race cars are starting to look more modern than the yachts that line the harbour. But don’t let this fool you, yachts are keeping apace. Only a year later, for instance, the Jon Bannenberg design The One, launched as Carinthia VI, debuts – which is still regarded as one of the most beautiful yachts in the world and has gone on to inspire modern builds like Lürssen’sLimitless. In the photo above, French driver Jean-Pierre Beltoise drives his BRM to victory, winning the 1972 Monaco Grand Prix. The yachts in background watching the race all fly the classic pennant flags and look very stately indeed. Ah, the 80s. Big hair, big shoulder pads and a big focus on yacht windows. Aside from the classic yacht (third one in) with the Portuguese bridge, all the motor yachts trackside at the Monaco Grand Prix in this picture from 1988 have some rather interesting superstructure design choices that place them in this particular era. Aggressively angled wheelhouses, triangular shaped windows and tinted blue flybridge windscreens are on trend. Also trending, only half the yachts are now flying pennants and there seems to be a lot of swimwear as the outfit of choice and a lot more skin on show. Here we can see that the yachts are clearly starting to take centre stage, with McLaren Honda driver Alain Prost of France racing past them – he finished first place that year. Ah, the 80s. Big hair, big shoulder pads and a big focus on yacht windows. 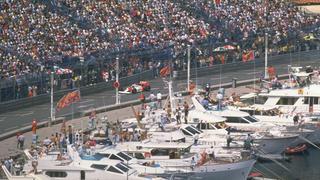 Aside from the classic yacht (third one in) with the Portuguese bridge, all the motor yachts trackside at the Monaco Grand Prix in this picture from 1988 have some rather interesting superstructure design choices that place them in this particular era. Aggressively angled wheelhouses, triangular shaped windows and tinted blue flybridge windscreens are on trend. Also trending, only half the yachts are now flying pennants and there seems to be a lot of swimwear as the outfit of choice and a lot more skin on show. Here we can see that the yachts are clearly starting to take centre stage, with McLaren Honda driver Alain Prost of France racing past them – he finished first place that year. This shot of yachts at the 1990 Monaco Grand Prix aptly depicts the end game of yachts’ migration over the decades as they've moved from out in the harbour to the seawall in the Port of Hercules. Perhaps what's most striking in this photo is how different security is from today; no gates, no guards and the yachts firmly affixed to the wall rather than floating just off and tendering guests in. Alain Prost of France drives his Scuderia Ferrari SpA Ferrari 641 Ferrari V12 past the yachts moored stern-to in the harbour during a practice for the 1990 Monaco Grand Prix. This shot of yachts at the 1990 Monaco Grand Prix aptly depicts the end game of yachts’ migration over the decades as they've moved from out in the harbour to the seawall in the Port of Hercules. Perhaps what's most striking in this photo is how different security is from today; no gates, no guards and the yachts firmly affixed to the wall rather than floating just off and tendering guests in. Alain Prost of France drives his Scuderia Ferrari SpA Ferrari 641 Ferrari V12 past the yachts moored stern-to in the harbour during a practice for the 1990 Monaco Grand Prix. 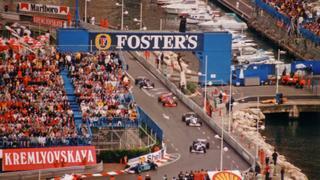 The mid-1990s saw sponsorship and advertising along the race track on the harbour rise to its full effect. Now yachts along the quay not only enjoyed a front row view of the racing action, but were unable to escape being inundated by advertising and branding of all kinds. Welcome to the modern world of sports. The photo above shows the warm-up lap before the 1996 Monaco Grand Prix. The cars, starting from the front, are Mika Hakkinen (McLaren), Heinz-Harald Frentzen (Sauber), Jacques Villeneuve (Williams), Mika Salo (Tyrrell), Jos Verstappen (Footwork) and Johnny Herbert (Sauber). The partially hidden car behind Johnny Herbert's is the Ligier of Olivier Panis, who took the top podium spot at the 1996 MGP. The mid-1990s saw sponsorship and advertising along the race track on the harbour rise to its full effect. Now yachts along the quay not only enjoyed a front row view of the racing action, but were unable to escape being inundated by advertising and branding of all kinds. Welcome to the modern world of sports. The photo above shows the warm-up lap before the 1996 Monaco Grand Prix. The cars, starting from the front, are Mika Hakkinen (McLaren), Heinz-Harald Frentzen (Sauber), Jacques Villeneuve (Williams), Mika Salo (Tyrrell), Jos Verstappen (Footwork) and Johnny Herbert (Sauber). The partially hidden car behind Johnny Herbert's is the Ligier of Olivier Panis, who took the top podium spot at the 1996 MGP. In 2006, we see the yachts at the Monaco Grand Prix coming into their full form. The harbour is brimming with yachts of all sizes, from classic motor yachts to sporty open yachts and, in the middle of the port, the very large superyachts and even a sailing yacht of superyacht proportions. What we see here in particular is how security has changed, a stark contrast to the photo from 1990. Less than two decades later, yachts are not content to snug along the seawall with nary a guard in site. Now even the smaller yachts have a fence surrounding them, and the larger yachts are moored off the wall to the north side of the harbour, with yacht tenders ferrying guests out to them. In a very lively Monaco Grand Prix this year, that saw crashes and some ferocious over taking, the win went to Fernando Alonso. 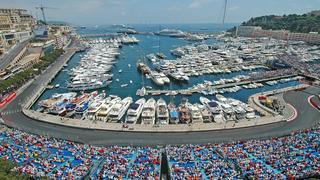 In 2006, we see the yachts at the Monaco Grand Prix coming into their full form. The harbour is brimming with yachts of all sizes, from classic motor yachts to sporty open yachts and, in the middle of the port, the very large superyachts and even a sailing yacht of superyacht proportions. What we see here in particular is how security has changed, a stark contrast to the photo from 1990. Less than two decades later, yachts are not content to snug along the seawall with nary a guard in site. Now even the smaller yachts have a fence surrounding them, and the larger yachts are moored off the wall to the north side of the harbour, with yacht tenders ferrying guests out to them. In a very lively Monaco Grand Prix this year, that saw crashes and some ferocious over taking, the win went to Fernando Alonso. As the race has grown into the most important and glamorous of automotive races, so too has spectator element of enjoying the prestigious perch of watching the Monaco Grand Prix from a yacht. Every year, more and more yachts squeeze into Port Hercules for the event – or anchor offshore – hosting fabulous parties attended by yacht owners and their VIP guests, yacht charterers and celebrities. Nine decades after the Monaco Grand Prix premiered in the petite principality of Monaco, and the yachts are night and day to those seen in the early years. No less than 171 superyachts were spotted in and out of the harbour on the first practice day (May 27), including 82.3 metre Secret, 75.5 metre Boadicea, 99 metre Madame Gu. As the race has grown into the most important and glamorous of automotive races, so too has spectator element of enjoying the prestigious perch of watching the Monaco Grand Prix from a yacht. Every year, more and more yachts squeeze into Port Hercules for the event – or anchor offshore – hosting fabulous parties attended by yacht owners and their VIP guests, yacht charterers and celebrities. Nine decades after the Monaco Grand Prix premiered in the petite principality of Monaco, and the yachts are night and day to those seen in the early years. No less than 171 superyachts were spotted in and out of the harbour on the first practice day (May 27), including 82.3 metre Secret, 75.5 metre Boadicea, 99 metre Madame Gu. As the years have gone by, the yachts in attendance have only grown in size and number. In this photo taken at last year's Monaco Grand Prix this is evident, with the harbour at Port Hercules filled by superyachts and even a cruise ship. The fee to be docked berth side for the Monaco Grand Prix can be up to €16,625 per day for a 60 metre yacht, which is nearly 14 times more than the typical summer season rate of €1,200 per day. Booking must take place far in advance. But there are likely many more yachts that would pay it if they could, as the harbour fills up every year. What isn't pictured is the bay just beyond the harbour, which is also filled with an incredible amount of superyachts. Each year more and more yachts and guests flock to this high-octane event, equally to watch the racing action and enjoy the superyacht parties. Attending this year? Buckle up! It's going to be a fun ride. As the years have gone by, the yachts in attendance have only grown in size and number. 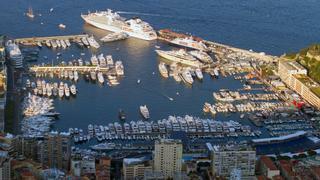 In this photo taken at last year's Monaco Grand Prix this is evident, with the harbour at Port Hercules filled by superyachts and even a cruise ship. The fee to be docked berth side for the Monaco Grand Prix can be up to €16,625 per day for a 60 metre yacht, which is nearly 14 times more than the typical summer season rate of €1,200 per day. Booking must take place far in advance. 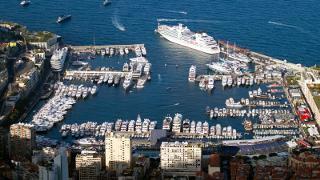 But there are likely many more yachts that would pay it if they could, as the harbour fills up every year. What isn't pictured is the bay just beyond the harbour, which is also filled with an incredible amount of superyachts. Each year more and more yachts and guests flock to this high-octane event, equally to watch the racing action and enjoy the superyacht parties. Attending this year? Buckle up! It's going to be a fun ride.